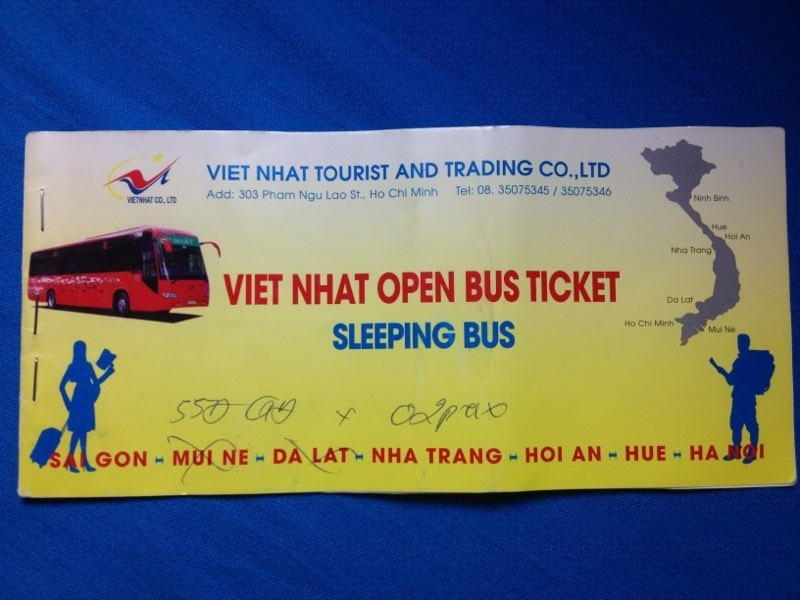 Vietnamese travel agencies offer what’s called an “Open Bus Ticket”. 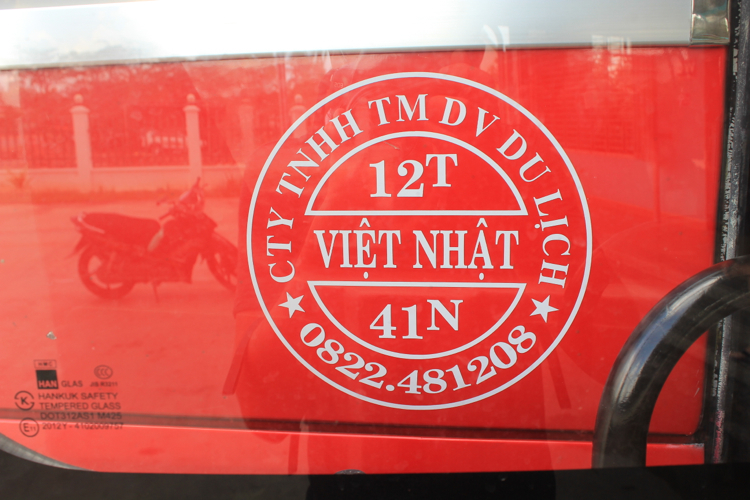 It allows you to travel from Ho Chi Minh City in the south all the way to Hanoi in the north (and probably vice versa), with various stops in between. The more stops, the more it costs. 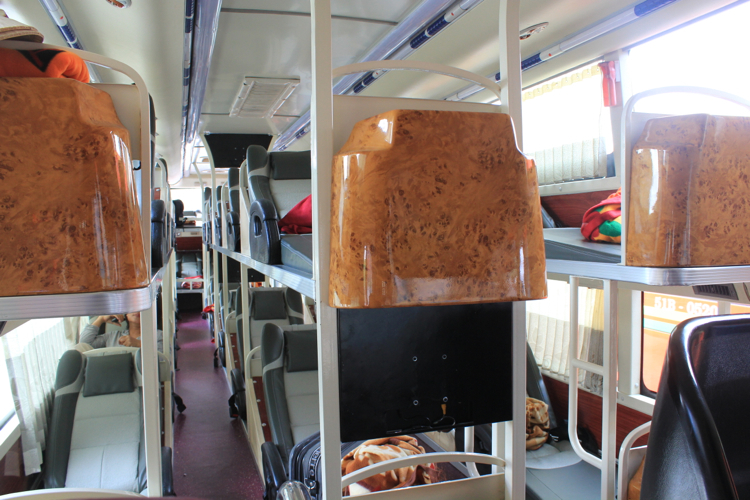 You can choose a sleeper bus or a sitting bus. Sleeper busses are more expensive. The busses are all supposed to have AC and toilets onboard. Unfortunately, the toilet thing is hit and miss (sometimes you’ll get one and sometimes you won’t) and the AC could be very cold or very weak. 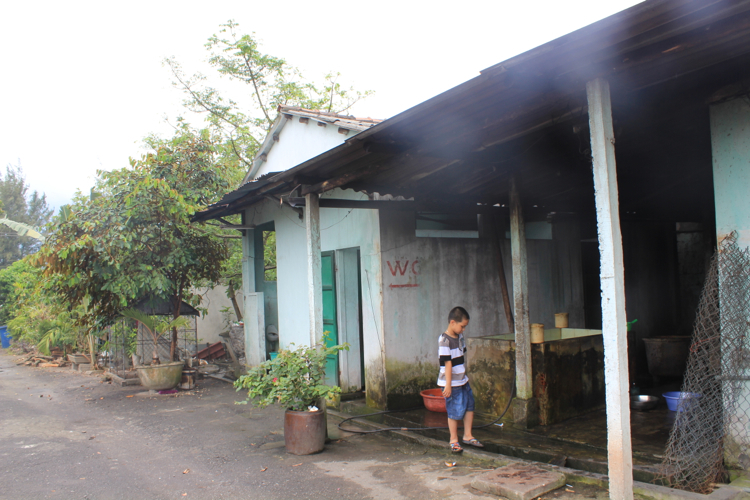 For our time in Vietnam, we had planned on checking out Ho Chi Minh City, Hoi An and Hanoi only. 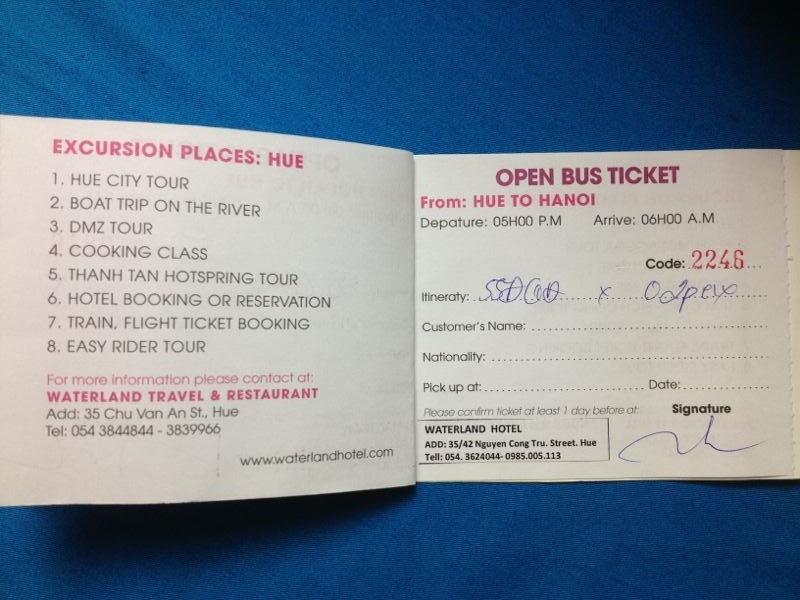 When we were ready to go to Hoi An, we naturally went to a bajillion (or maybe 7) travel agencies to compare prices. There isn’t a route that will go from Ho Chi Minh City to Hoi An directly (which makes sense because it is a distance of nearly 1,000 km), so all the travel agencies offered us a ticket that will take us from Ho Chi Minh City to Nha Trang, and then from Nha Trang to Hoi An for about 450,000 dong (~$22 CAD). Right when we were ready to go forward with whoever could offer us the cheapest price for this trip, we heard about the open bus ticket. As it turned out, we were already about to buy an open ticket. We were simply going to use it all at once, even though the ticket allowed us to stop by at Nha Trang, and then continue onward to Hoi An whenever we so choose. So we thought we may as well get a ticket that will take us all the way to Hanoi, as we assumed it would be cheaper and simpler this way. I grabbed an information sheet from each travel agency I wandered into. 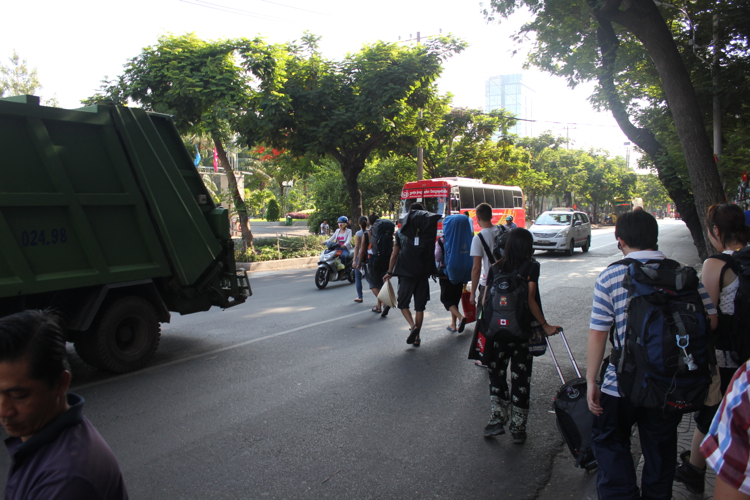 We were staying near Pham Ngu Lao (the backpacker street) and they were everywhere! You could walk 100 metres and see 10 of them. The info sheets pretty much all look the same, some with more information than others, although you might have to ask the travel agent for them. The sucky-er ones don’t show you their prices. Here are two out of the many I’ve taken. The route with the most segments takes you from Ho Chi Minh City (A) -> Mui Ne (B) -> Da Lat (C) -> Nha Trang (D) -> Hoi An (E) -> Hue (F) -> Hanoi (G). You can stop by at all of these locations, and when you’re ready to move on, simply visit the affiliated travel office in your current location one day in advance. 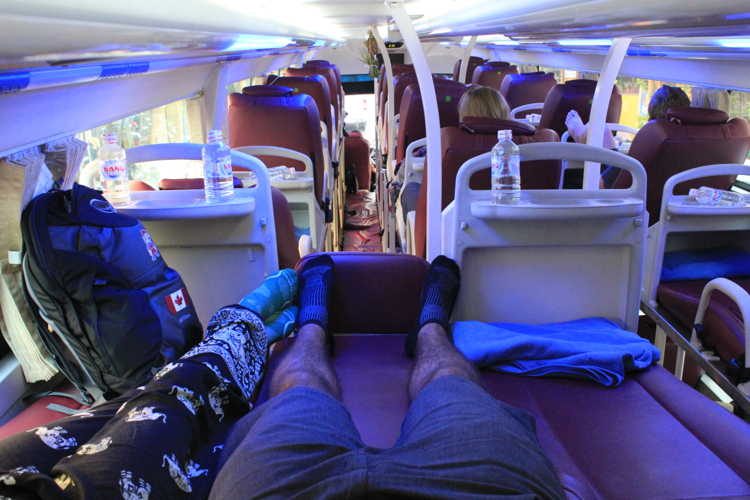 The sleeper bus ticket ranged from 950,000 – 980,000 dong ($46 – $48 CAD). 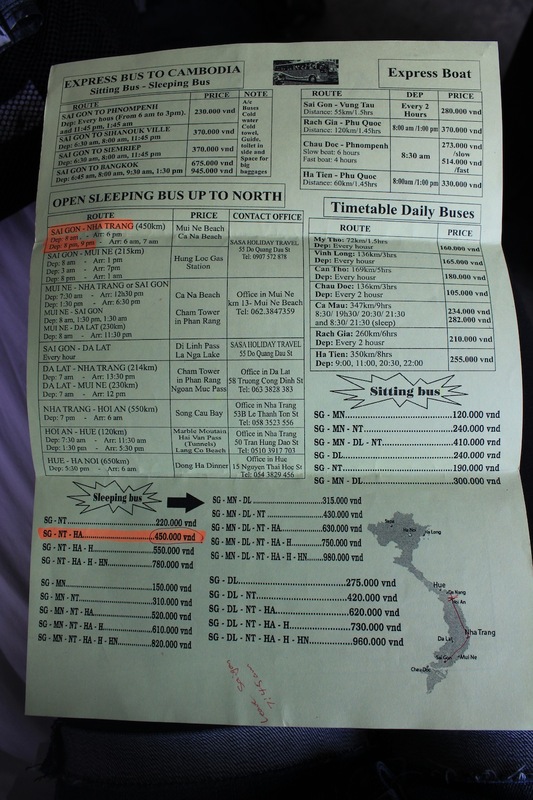 Looking at the flyers again, it appears that the longest distance you can travel with a sitting bus is Ho Chi Minh City -> Mui Ne -> Da Lat -> Nha Trang. The price range for this was 390,000 – 410,000 dong ($18 – $20 CAD). You can probably haggle these prices down if you tried. Note that you’re not obliged to stop by at all of the destinations. 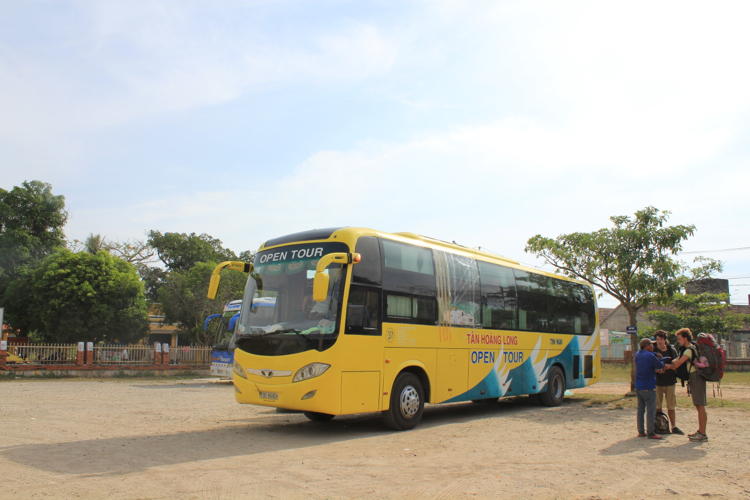 Let’s say you don’t want to visit Da Lat, you can try to schedule your journeys so that once you arrive in Da Lat, you can hop onto the next bus to Nha Trang on the same day (if the schedule allows for it). 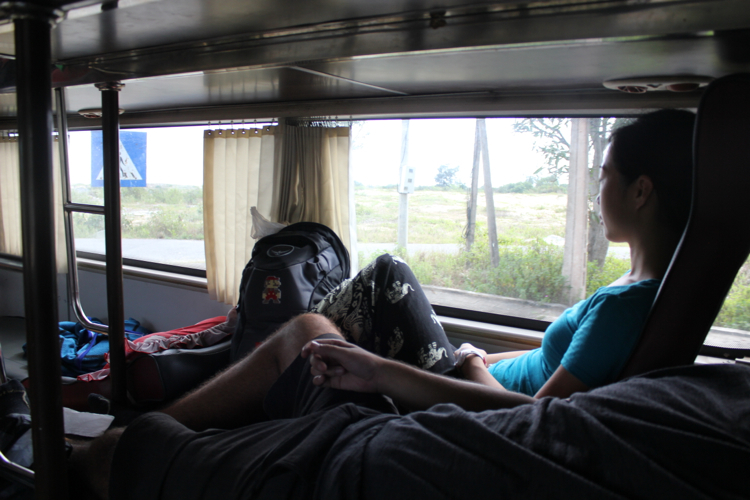 Less than $50 CAD to travel 1,950 km from south Vietnam to north Vietnam is not too shabby for the poor backpacker! When you board, you are asked to remove your shoes. The driver will give you a plastic bag to put it in. 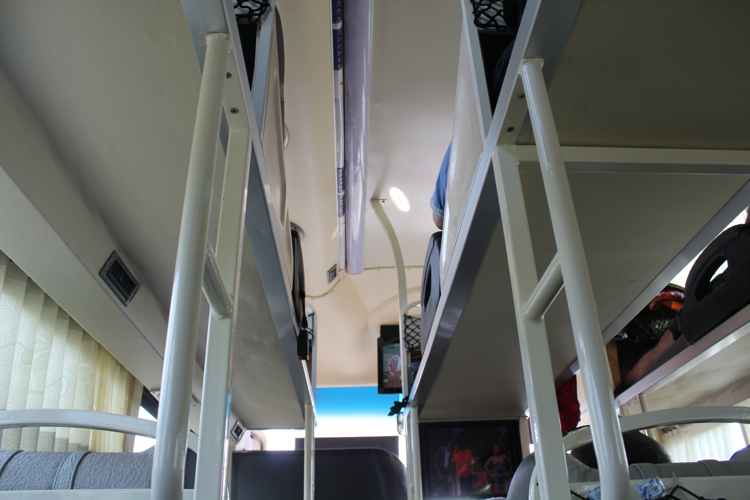 You are then presented with 3 columns of bunk beds. You are usually provided with at least a pillow and a blanket. If the bus is nicer, you will be given a small bottle of water, and the blanket might even be clean. Otherwise it could very well be a blanket that the previous passenger(s) have used. There are small steps to get onto the top bunk. The seats can be put into sitting or sleeping position, but it doesn’t recline all the way down due to the leg wedge of the passenger behind you (see below). You also might not have enough head space to sit up straight if you are tall. Your legs go into this wedge cubby thing. If you’re lucky, you’ll get a nice clean toilet like this! But don’t count on it. It’s more likely that you will either get no toilet, or a dirty one (see below). Poor customer service aside, the more unscrupulous travel agents will promise you the moon when you walk in. The immaculately clean toilet the travel agent promised us. If only you could smell it… Remeber that you don’t have shoes on in this mess. When the busses did have toilets, they were either disgusting, or padlocked so you can’t use them. You would think that the driver would do regular pitstops then. Nope not so much. Oh the driver will stop alongside the road when THEY need to relieve themselves, but they won’t bother telling you. So when the bus stops, you’re left wondering if you could go empty your bladder. By the time you’re in mid-wonder, the driver has hopped back on. I think during one 10 hour bus ride, we may have had two pitstops in all. Of course these would be stops at places where you have no other options in sight where food is concerned, so you’re left with minimal and expensive choices where your driver gets a kickback when you’re not looking. If you’re lucky, you will have a driver who is nice enough not to yell at you when you request a quick stop at the side of the road. This makes it much more inconvenient for women. 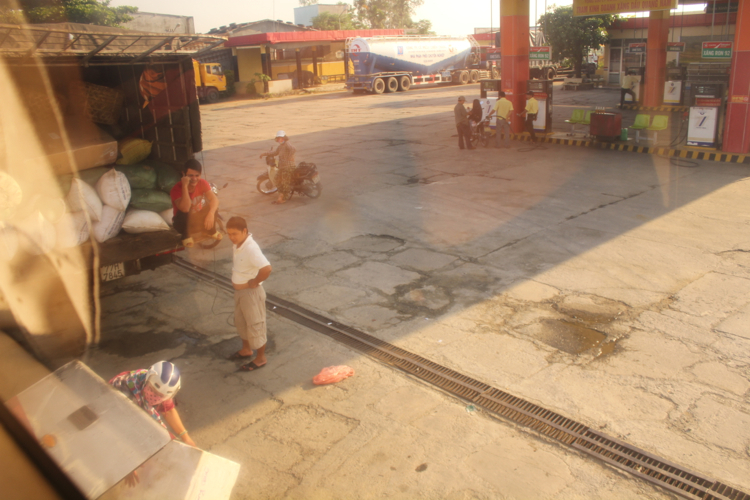 By our last bus journey, we had concluded that we would rather starve and dehydrate ourselves before the trip so that we were not at the mercy of exceptionally surly drivers. Remember to always bring toilet paper and sanitizer or wet wipes, both for the toilet on the bus (when there is one) and the public washrooms. We were very happy to hear this! 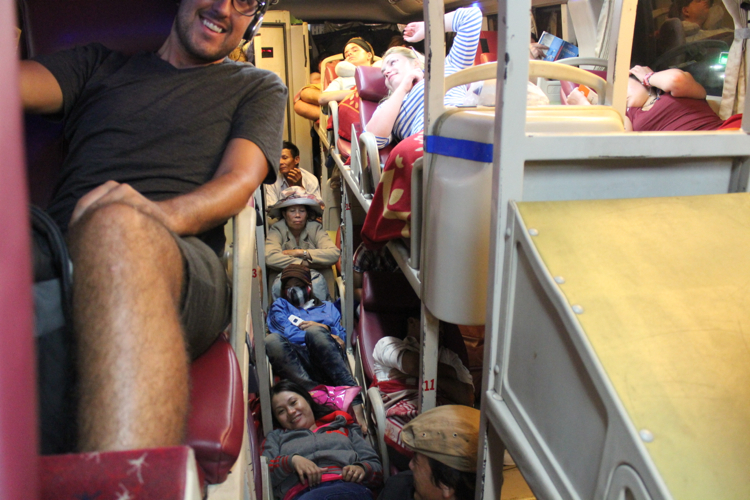 Because Adam does happen to be a rather tall foreigner and we were indeed concerned that he would not have enough leg space to sleep comfortably. Alas, it was just another false promise to get us to hand over our money. Adam’s legs could not fit into the wedge without smooshing his feet. If you’re tall and need more leg space than most little asian people, try to go for the seats at the back of the bus. More specifically, go for the seats at the back of the bus that face the aisle. That way you don’t have to put your legs into a wedge cubby. The same position on the top bunk works as well. This was an outright lie, and the travel rep said it so sweetly to our faces too 😦 When we got on the first bus, there were no assigned seats. It was pretty much a free for all. On most of the busses, you would usually be asked not to sit in the front few rows. I’ll get into that later. Scenario 2: You are led by the driver to the seats he thinks is best. You will likely be ignored if you make any requests. There’s not much you can do about this. Just don’t be too surprised when you don’t get the seats you thought you were going to get. There were many things we weren’t prepared for or didn’t expect. Maybe if you knew about them in advance, you could at least psych yourself up first. 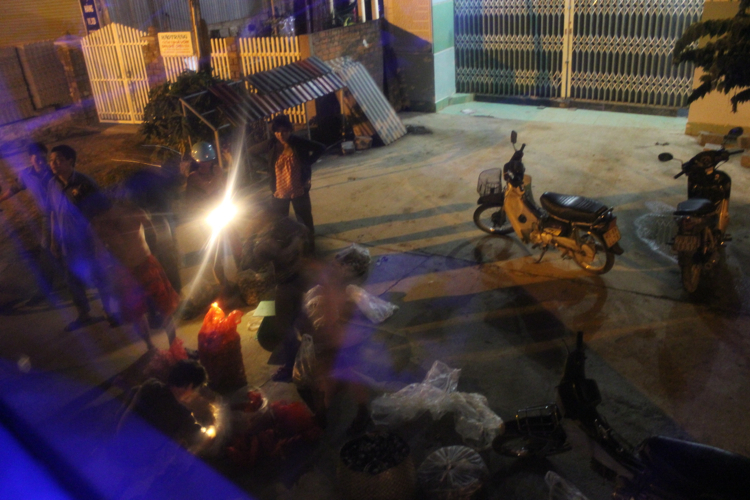 Vietnam does not quite enforce no-smoking-in-confined-spaces, and many people smoke. Your driver will probably chain smoke with the window open. While the opened window helps, the smoke still gets into the bus. Vietnamese drivers are very aggressive. The bus drivers are more so, and they honk at every single vehicle in front of them, behind them, beside them, coming towards them, etc. They honk at everyone and everything they see (vehicles, scooters, bicycles, pedestrians, women, children, cows, chickens). This means the horn will be going every 5 seconds. They’re not light taps either. These are loonggg drawn out honks. Eventually the driver gets lazy and simply lays on the horn indefinitely. You will often get thrown around on the bus. It’s best that you don’t look out the front window to see what’s happening. The drivers are swerving around everything that’s in their way, and they’ll go into the lane with opposing traffic if they need to. That’s what all the honking is for. There is no such thing as common courtesy. 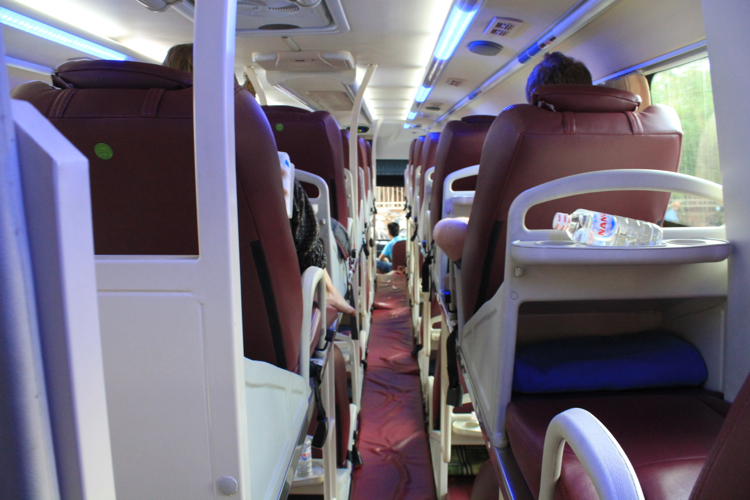 Despite it being a sleeping bus, Vietnamese passengers may talk on their phone or to their friends louder than necessary. More common yet, they may play music from their cell phone loudly. I assume they don’t like headphones? This is the big one! The one that gets our goat the most! If it weren’t for hop ons and cargo stops, it would cut travel time down significantly. The reason you’re asked not to sit in the front few rows is because they are reserved for what we call “hop ons”. Once a bus picks up all of its foreigner passengers, it proceeds to pick up hop ons. These are locals that pay a minute fraction of the price tourists pay. Not only that, but the bus will go out of its way to pick them up and drop them off in the various towns near the main route. This means that what could’ve been a 3 hour journey ends up being 4 or 5 hours with all the detours made. Hop on paying his fare. Notice the guy sleeping in the aisle. The front rows are reserved for hop ons so that they can get on and off quickly as there is much turnover. These people are basically hitching a ride for whatever distance they require. They may or may not stay on for the entire journey. One person might hop on at the beginning of the ride and get off in a town somewhere along the way, while another person will get on from that town. Cargo stops are another issue, and also adds to travel time. Again the bus will make several detours to accomplish this, and stop for any amount of time to load up cargo, and then deliver them. If a driver is efficient, he would pick up both hop ons and cargo at the same time. 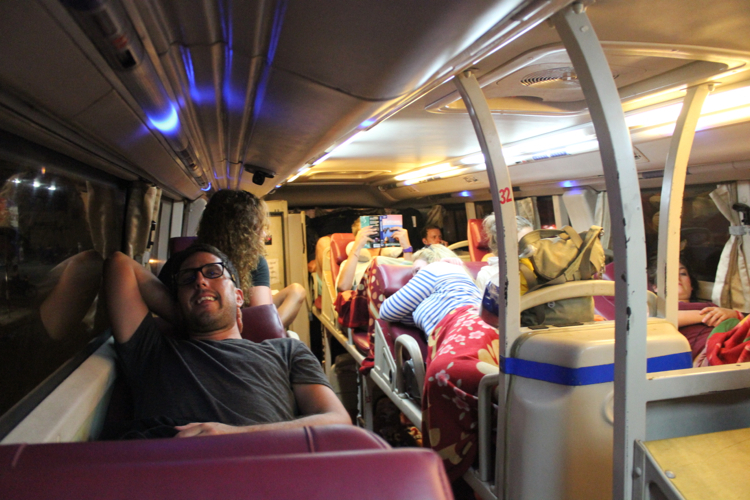 The series of photos below are from one bus ride, from night to morning (Nha Trang to Hoi An). Another cargo stop. Before we load up the bus, we must first weigh and then transfer a bunch of seafood into various bags. This stop was probably an hour long. 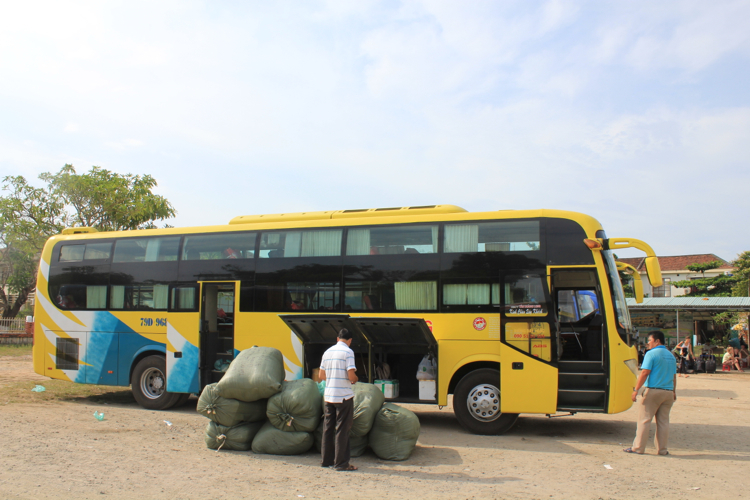 I’m not sure if hop ons and cargo stops are just another part of bus services in Vietnam, and everyone has learned to expect it. Maybe that’s why the open bus ticket is so cheap, because it is subsidized by these extra activities. Either way, we were incredibly upset because we had expected the bus to go directly to its destination. 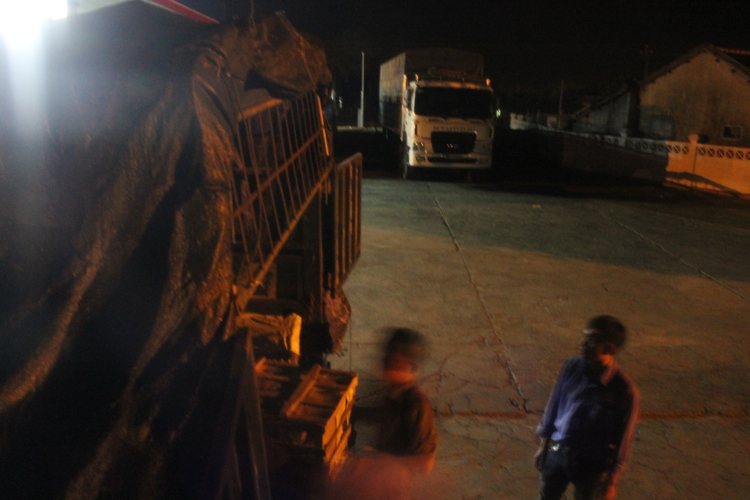 We did not realize that a large part of the journey included making numerous detours and loading cargo. Do not expect the busses to be on time. The indicated time of departure and arrival are rough guidelines really. But of course you should assume the departure time is accurate so you don’t miss it. While the hop ons get dropped off at their requested destination, you the tourist, will be taken to a travel agency where they badger you with offers to take you sightseeing. If not a travel agency, then a bus station. Rest assured that no matter where you get dropped off, you will immediately be surrounded by touts the second you step out of the bus. Bring earplugs or music. Noise is inevitable. Wear socks. If you’re a bit of a germaphobe like me, having socks on made me feel a little bit better about having to take my shoes off. Avoid consuming too much liquids beforehand, for you don’t know when your next pitstop will be, and whether or not the bus will have a toilet. Bring gravol if you get car sick, as there is a high possibility of much swerving. Bring snacks, incase pitstops are minimal or you simply don’t want to be at the mercy of the overpriced restaurants the driver takes you to. Bring toilet paper, wet wipes and/or sanitizer. 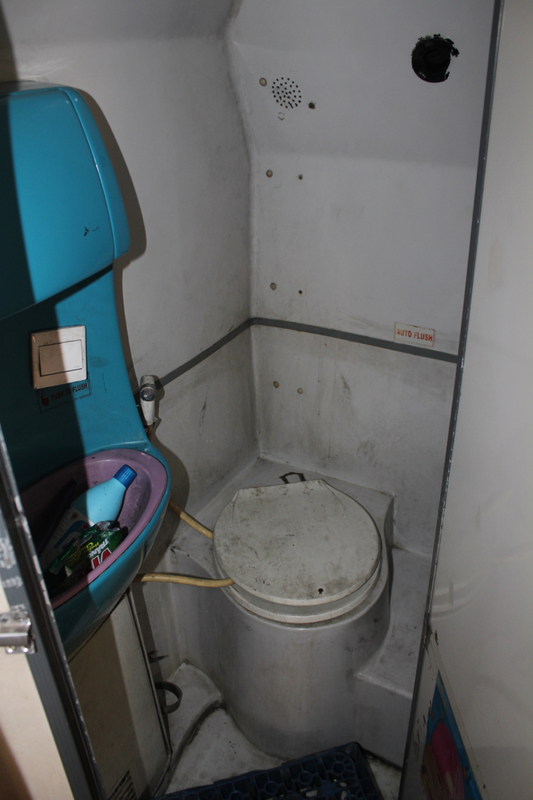 If there is a toilet onboard, it likely won’t be very pleasant, and it won’t have running water. The public washrooms aren’t the most hygienic either. Wear layers and bring a sweater. You’ll never know if the bus AC will be too strong or too weak. Adam and I have gotten quite sick from a very cold bus ride. We were out of commission for nearly 4 days. If possible, try to get the seats at the back of the bus. You will have more leg room and you’ll be further away from the incessant honking and smoking. Bring as little on the bus as possible. You will have to share whatever little bit of space you have with your carry-on and shoes. There is no storage cabin on the bus. Keep your valuables close, but try to leave the rest in your suitcase. Perhaps it was our own fault that our experience was less than stellar. Our goal was to search for the cheapest open bus ticket available. I had not done my research beforehand, so I didn’t know (and still don’t know) if there were more reputable tour companies that actually went directly to its destinations, with clean toilets and fresh blankets. Or maybe this was simply what you get with an open bus ticket, and you just have to be ok with it. From what we can gather, we speculate the way it works is that multiple tour companies and multiple travel agencies from various locations are all affiliated with one another, and they pool their resources to get you from point A to point B. Some busses were in better condition than others. Some drivers were nicer than others. Our last bus journey was fantastic. 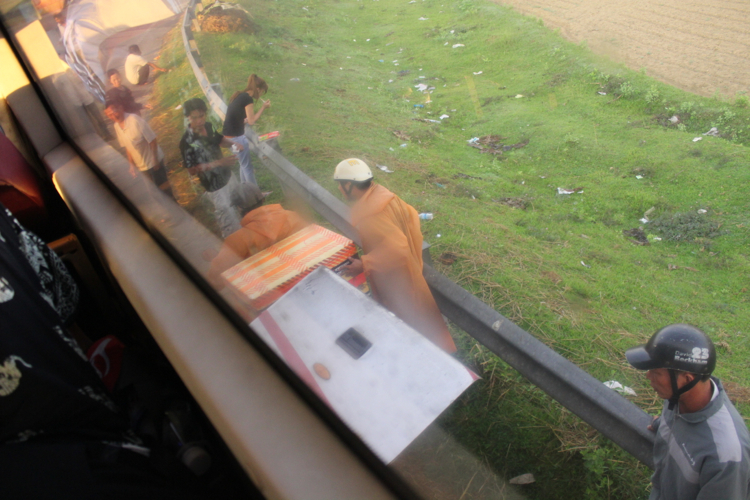 We had a brand new bus and it went directly to its destination (Hue to Hanoi). 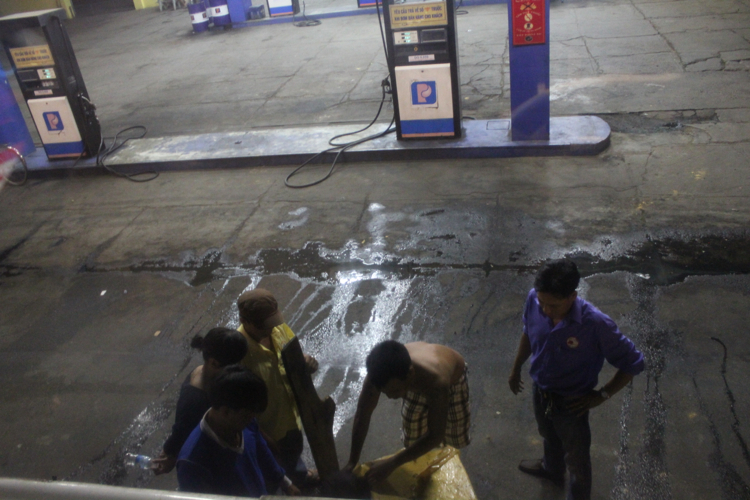 There was a clean toilet onboard and the driver made regular pitstops. We had a seat at the back of the bus so Adam had plenty of legroom, and the bus was not jam packed full so we could spread out! Maybe it’s all just hit and miss. If anybody has any insight on this, please leave a comment! 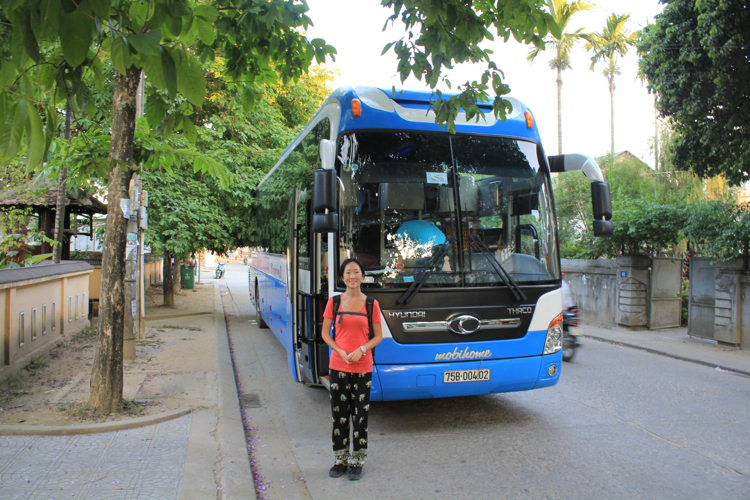 The open bus ticket was a cheap way of exploring Vietnam, but I would gladly pay more if it guaranteed cleaner busses that went directly to its destination. Out of a total of 4 bus rides, 2 of them were absolutely miserable, 1 was tolerable, and 1 was fantastic. An alternative to the open bus ticket would be to purchase the bus journeys as you go. This way maybe you can research the bus company before you buy, instead of having it all predetermined by the travel agency’s network. I personally don’t know how much cheaper the open bus ticket is compared to buying the journeys separately, but some travellers have reported that the savings are not very significant. Many think that taking an overnight sleeper is the best way to go, because you cover ground and you save on a night’s accommodation. We have found that this is not the case, unless you can sleep through anything. Perhaps it is because we are getting old, but after a long bus trip, we would arrive at our destination completely shattered and need a day to recover. 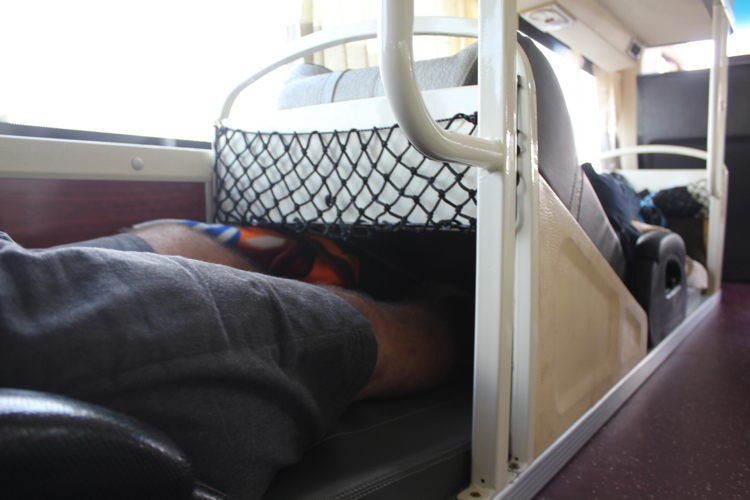 Even on the best bus we had, it was difficult to get decent rest. 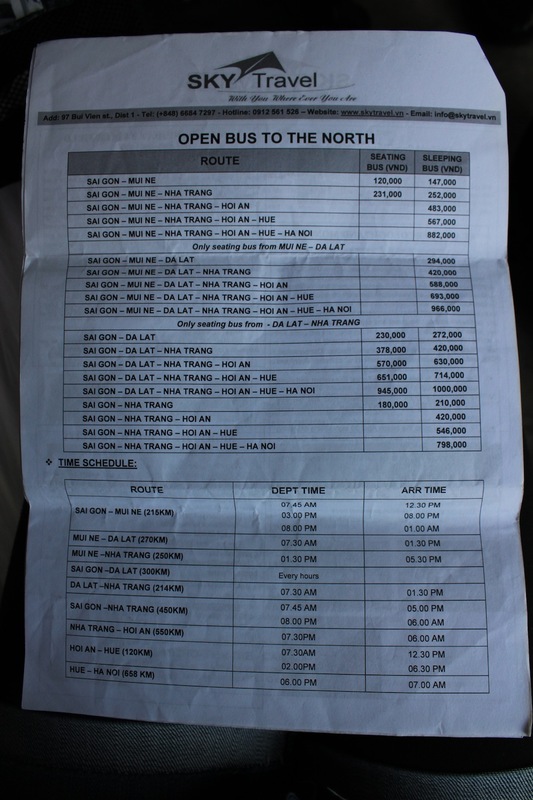 *Note that these schedules were what was shown on our travel company’s information sheet. Other travel agencies have slightly different times and schedules. There was no toilet on this bus as promised. We each got a small bottle of water, a relatively clean blanket and a pillow. Shortly after we left, we immediately got hop ons. Although not enough to start sitting in the aisles, they remained in the front few rows. This was the bus the travel rep guaranteed us good seats on, but it ended up being a free for all, so we chose two seats that were together. 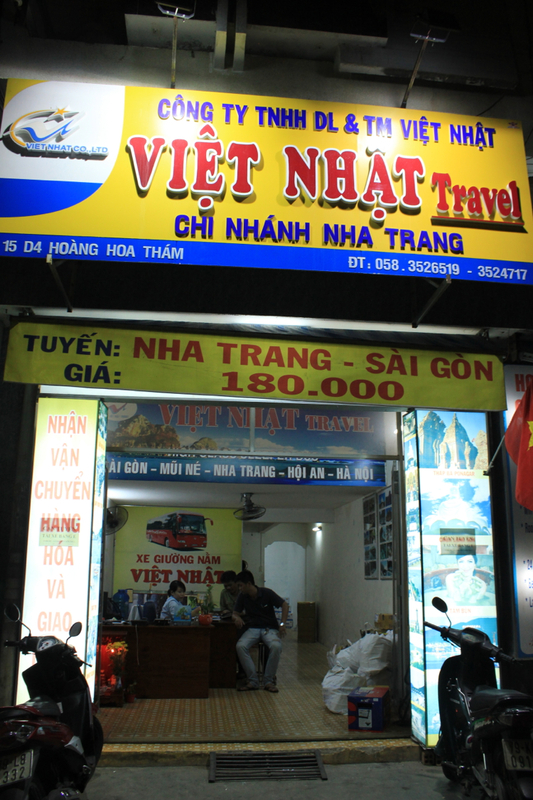 We were dropped off in front of the Viet Nhat travel agency in Nha Trang. Hoi An “bus station”, soon to be surrounded by touts. The blankets provided were definitely used by the passengers before us. 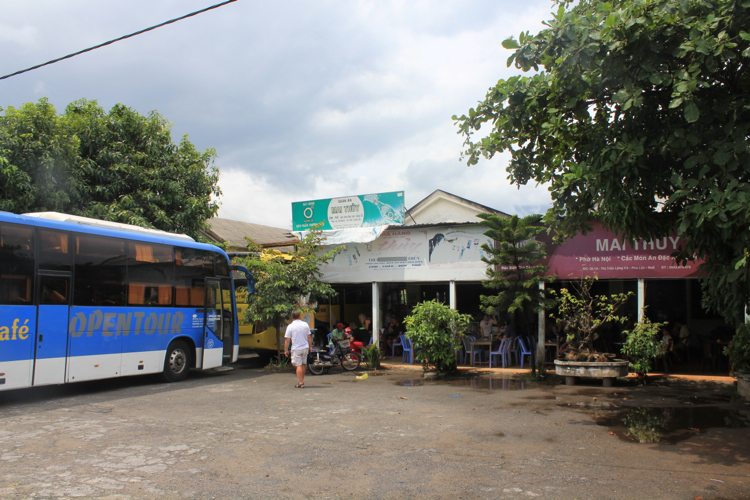 We were dropped off at the Hoi An bus station, with touts nearby ready to attack. This bus was older and grimier than the other ones we’ve been on thus far. 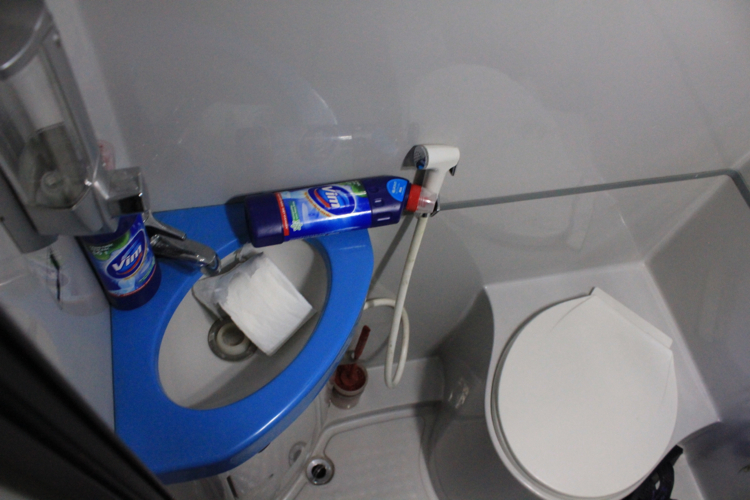 There was a toilet onboard, but it was padlocked shut. 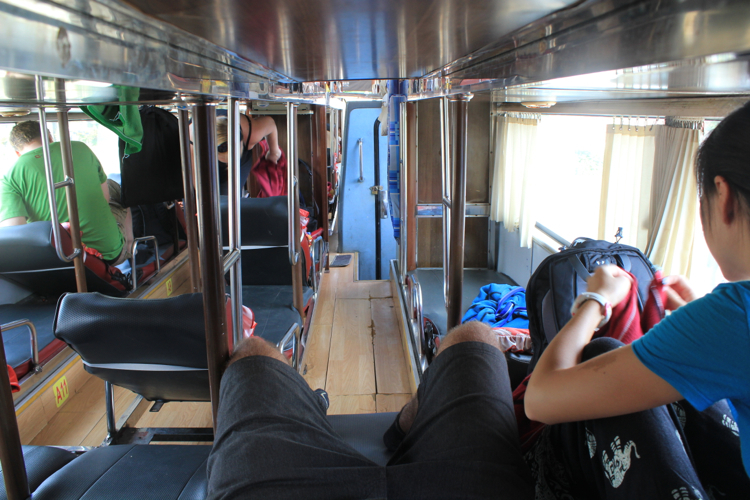 We were able to choose the back seats on this bus so the journey was more tolerable because we had more leg room. We could see that this bus had just dropped off another load of passengers and did a very quick sweep of the floors before letting the new wave of passengers on. It was clearly not a thorough job, which also meant used blankets. 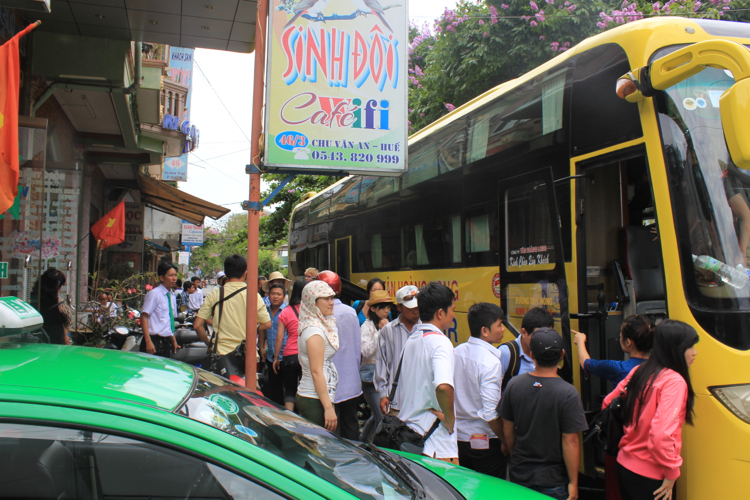 We were dropped off in front of a travel agency in Hue, with touts ready at the waiting. 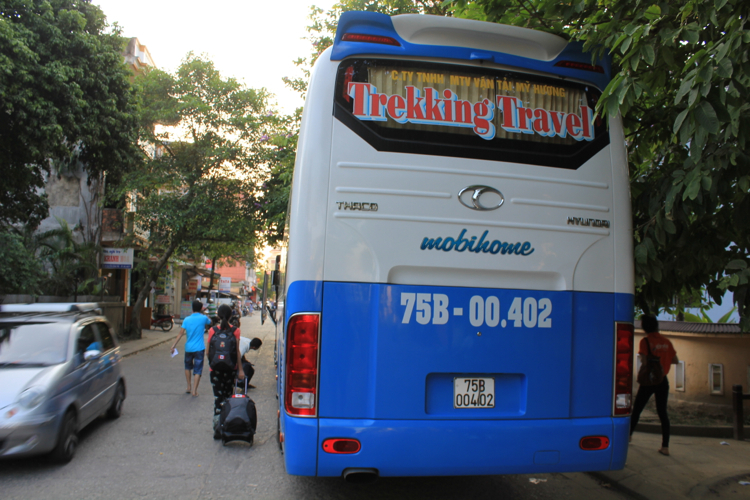 Trekking Travel Bus Company. By far the BEST out of all the busses. It was brand new. Maybe this is a more reputable company? 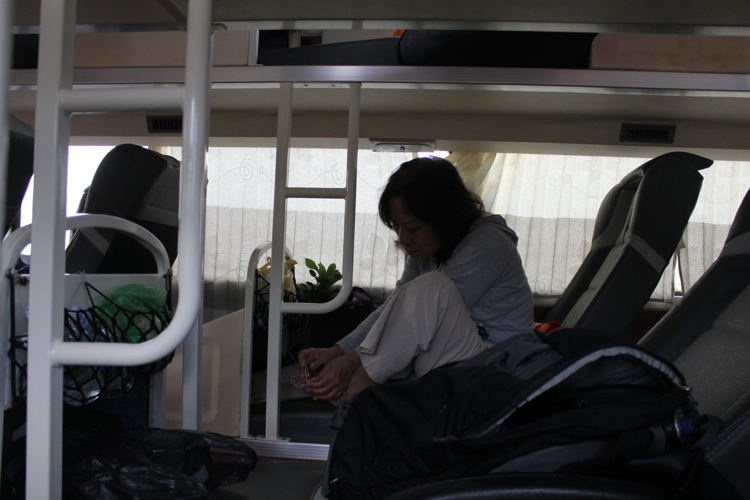 This was our best sleeper bus experience. The driver assistant who came to meet us at our hotel led us to the bus, and then assigned us the top bunk seats at the back of the bus, which was greatly appreciated! It also helped that the bus was not full, so we even had the two seats next to us completely empty the entire time. The bus was brand new and had what looked like an untouched toilet. We were given a small bottle of water and a clean blanket. There was even a small area behind us to store our shoes! Thanks for the detailed information Julie! I actually got too lazy to research about the open tickets and just bought individual tickets from the hostel. Gosh I almost was able to block out the sometimes unpleasant journey from city to city in Vietnam and the countless empty promises from the travel agents. I have to say flying from HCMC to Hoi An wasn’t any better with TONS of line cutting going on at the airport. Thanks for the fantastic write ups. We’re at the beginning stages of planning a short trip, and these write ups are awesome. Thanks again. Thanks for the great information, we are thinking of buying an open bus ticket soon, but maybe just with the best bus company you mentioned! Thanks Julie for your really informative and honest posts. I can not tell you how helpful they have been as we embark on our journey to Cambodia, Vietnam and Laos. Very helpful: helps to make good decisions. Thank you again! I’m so glad you’ve found these helpful! Have a wonderful trip!! Thanks Julie for putting In so much effort to share with us ur slper bus experience. This is a fantastic resource. I’m currently in Vietnam making my way from Saigon to Hanoi. I am unlikely to use an open bus ticket since I want to use the train for a good part of the journey. 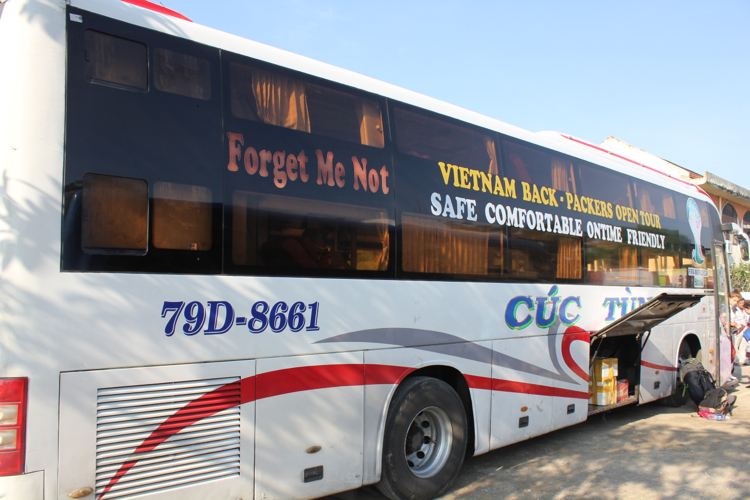 What I found interesting what that I also had a similar poor experience with a long distance bus, and the name of the bus company…Viet Nhat. 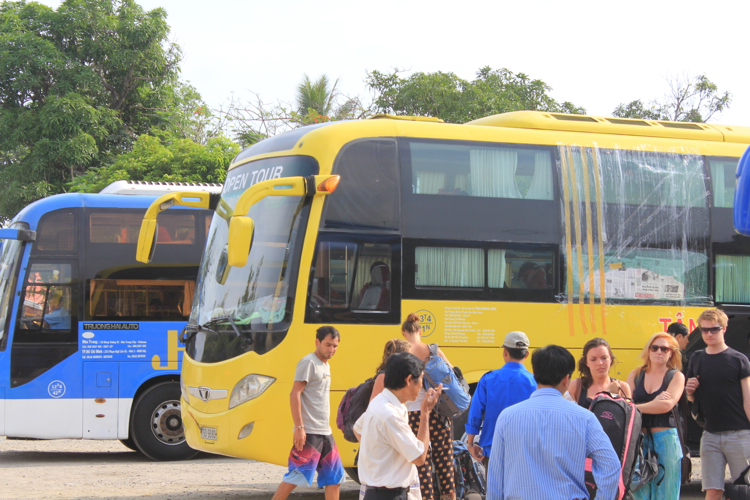 I bought a bus ticket to go from Saigon to Mui Ne through a travel agent. Instead of stopping at my guesthouse as it went through main beach accommodation area towards Mui Ne, they refused to stop and went to a restaurant/travel agent 2km further down the road. I could only get back to my hotel for free 40min later (i.e. after lunch/driver kickback) on a different bus heading back to Saigon as a “hop on” as you have referred to. This pissed off pretty much all the foreigners on the bus as this was not what we were promised. 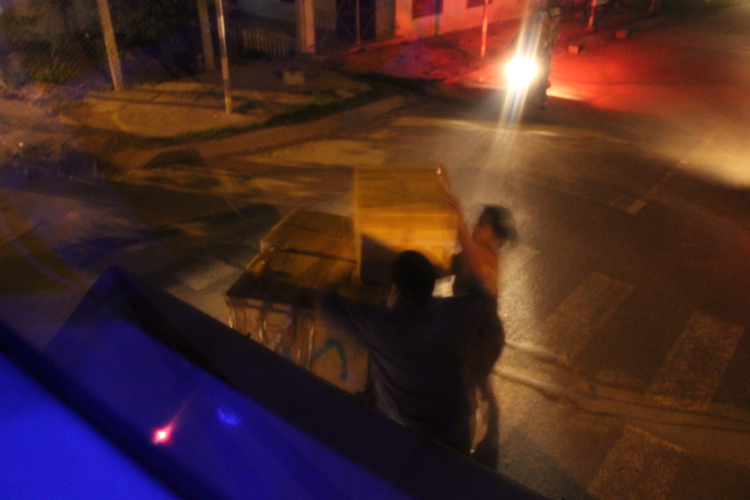 Of course, it was no problems dropping off local Vietnamese hop-ons exactly where they wanted to go. Bus driver and the conductor also completely unhelpful and refused to listen as I was complaining. Yea it’s frustrating isn’t it?? Thanks for sharing your experience! It’s nice to know that we weren’t the only ones who were put off by the whole thing. Great work! I’m putting together a South East travel planner for friends and you really set the bar. I went last year and am going back to piece together all the tips I need to include and realize now that I didn’t put near enough effort towards image documentation. Cheers man! When I get my guide together I will definitely refer readers to your page! Thank you for the kind words! Have an amazing time! Taking photos for the sake of using it in a guide is hard to do sometimes, especially when you’re pooped from all the travelling, but glad we did it in the end! I stumbled on your article here and find it very informative and funny at the same time(especially the part about honking), which was why I ended up reading it all despite that I already kinda decided which bus company to go for. Thanks for your patience to share your experience and knowledge! Woow, together with my boyfriend we where planning the same journey, so your post was very very helpful! thanks a lot for that, mainly because you wrote about every little thing that a person who is travelling really needs to know, even those details we are not aware of! This way is more expensive but we think it might be a comfortable and nice experience. Thank you very much for sharing your trip!! I would say that if I had to do it again, I’d likely want to shell out more for the comfort. Great information here, it will help us plan our trip through Vietnam over the next two weeks. 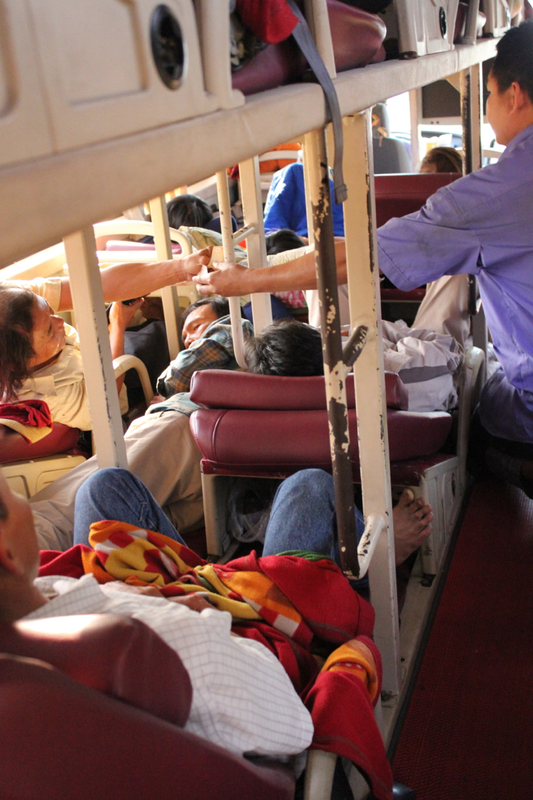 What a great synopsis of your travels on public transport in Vietnam. I was planning on using the bus as I leave on Sunday 13/12 but will now opt for the train. It certainly helps us mere mortals in planning well in advance by reading your observations as well as makes us realise what a lucky country we live in here in OZ! But then again, we travel because we want to experience other cultures and traditions so everything cannot be perfect all the time only sometimes!! Thank you for your comment! I am definitely spoiled and have taken my Canadian comforts for granted. While the trip was painful, looking back now I’m kind of glad we did it that way for the experience and memories! this is very informative ei… made the planning for my trip from Ho Chi Minh to Hanoi a lot easier. Too bad you has to experience all those but Thank you so much for saving many lives… Haha. What places do you suggest backpackers go to? Oh and were you able to enjoy your Vietnam trip overall? 🙂 how would you rate your trip? Hehe. We thought the backpackers street (Pham Ngu Lao) in HCMC was a cool place to hang out and get some cheap drinks & snacks (there were some really good bahn mi carts!). There were little boutiques for shopping and a ton of spas. Hoi An is a nice spot to wander around for a day or two. It’s very pretty at night. I would advise against checking out the tailors there though – something Hoi An is famous for if you’re looking for tailor made clothes. We found that they were all pretty much the same, and not that cheap for the quality you’re getting. All in all we had good memories of Vietnam to take with us, but our overall view is unfortunately negative 😦 I will say this was likely due to our travelling on a budget. We were also adamant about not getting scammed, so it kind of put us on edge the whole time. People certainly did try to rip us off, and we did fall for a few things. In the greater scheme of things, it wasn’t thaaat much money that we got scammed out of, but at the time it was the principle of the thing that bothered us. Vietnam haters have a saying that goes something along the lines of “Vietnam does not expect repeat travellers, so they try to get every penny out of you while you’re there”. This sort of rings true with us, because we have no desire to return. Despite all this, we’re still glad we went!